Eli Manning leads the NFL in interceptions (27) in 2013. 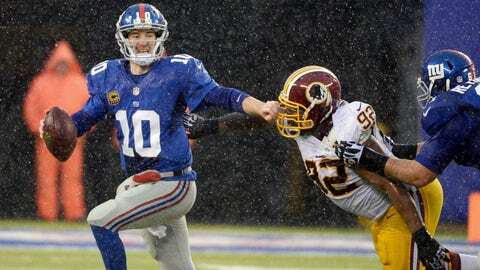 Eli Manning was in a walking boot and needed crutches after Sunday’s 20-6 win against the Redskins. Manning threw his league-leading 27th interception and sprained his ankle on the same play in the first half. He never returned to action. Manning completed 10 of 24 passes for 152 yards including a 24-yard strike to Jerrel Jernigan for a touchdown. It’s an ugly way to end Manning’s nightmare of a season. Manning posted a career low in touchdowns (17) and his completion percentage (58.3%) and total yards (3,666) were his worst over the last five years.